Digestibility and nutritional value　So different from Chlorella this much! There may be many people who question about how Chlorella and Spirulina are different. Indeed, the ingredients, and even the color and shape of the tablets are also similar. But, there're various differences between, for Spirulina belonging to the blue-green algae and for chlorella belonging green algae. 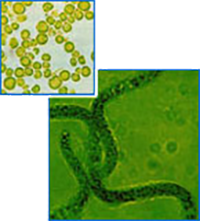 Rather, it can be said that it is Spirulina that newly appeared as a solution to overcome the shortcomings of Chlorella. Firstly, the drawback of Chlorella is that it is too small. Since it is about 0.3 to 0.5 micron in diameter and only 1 / 1000th the size of Spirulina, it is necessary to use a method which takes time and effort very much called centrifugation operation for collection. On the other hand, Spirulina can easily be harvested by filtration. Spirulina is far more suited for mass production. About 95% digestion in 2 hours! Next, since Chlorella is a unicellular plant, the cell wall is hard and it mentions that it is very bad digestion. In order to improve digestion, it is necessary to mechanically crush it or process it unnaturally, there is worry that the ingredients will be damaged to naught. On the contrary, since Spirulina is multicellular, the cell membrane is so soft that it can be digested very well without adding hands. So, it is hard for the feces to turn green. Please find the table. It shows the difference in digestibility between Spirulina and Chlorella quite obviously. 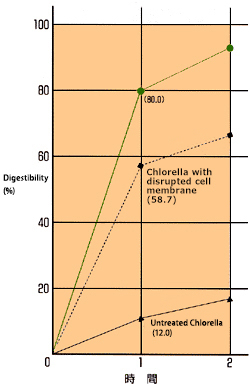 If the Chlorella is in untreated stage, the digestibility rate after 1 hour is 12.0%, and even if the cell membrane is destroyed, it is 58.7%. In case of Spirulina, if even it's not processed anything, it's 80.0%, and after 2 hours, it's 95.1%, which shows a very high digestibility, indeed. Also, the table below compares the nutrients of Spirulina and Chlorella. This table shows that Spirulina has higher nutritional value overall than Chlorella. Especially, the content rate of protein, pro Vitamin A, and Vitamin B12 seems high. There are other differences, such as the fact that the content of dietary fiber is 2 to 3% in Chlorella, while in Spirulina is 8 to 10% which is about 4 times of the former.